A recently released AAA report has found that drivers in Allegheny County receive more citations for texting while driving than any other county in Pennsylvania. Police began ticketing drivers for texting while behind the wheel in March of 2012. During the next year, 108 citations were given out to Allegheny County motorists. During the second year the law was in effect, the number of texting citations in the county grew to 126. In second place, Montgomery County police caught 125 drivers texting while driving. Drivers in Philadelphia County were the 3rd worst offenders—receiving a total of 93 citations during 2013. Police issued 1,206 citations throughout the entire state of Pennsylvania. Not only does texting while driving make a driver 23 times more likely to crash, but it's also a primary offense. Officers do not need to notice another traffic violation to pull someone over. The citation carries a $50 fine plus court costs of more than $90. If you suffered an injury from an accident involving a distracted driver, we know you're feeling frustrated. There are laws against cell phone use while driving and you shouldn't have to pay for someone else's mistake. We want to help you get the compensation you deserve. Submit your information at the top right of this webpage or call us at 1-866-943-3427. Our case consultations are free and you won't be obligated to use our services. 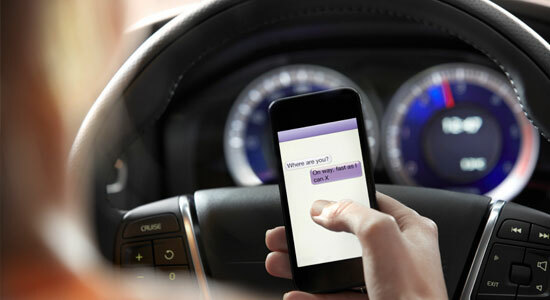 Source: “Allegheny County tops state in texting-while-driving citations.” Post-gazette.com. March 21, 2014.